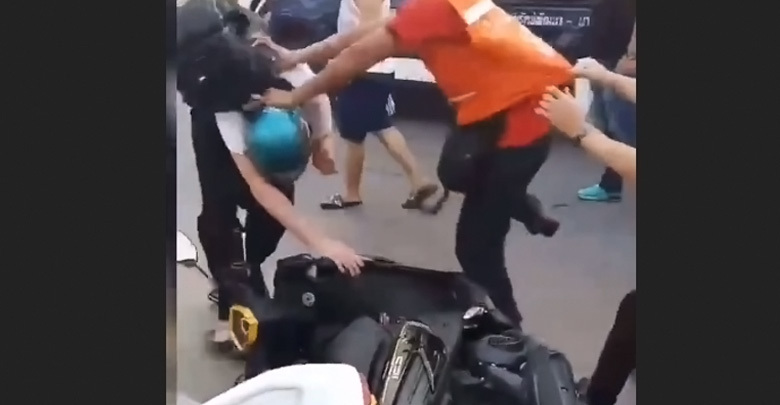 The motorcycle taxi rider who kicked the German tourist in the face has told Thai media that he was helping out the cops. He saw that the tourist was attempting to flee the scene - so he kicked him in the head. He regrets it now but he was provoked. 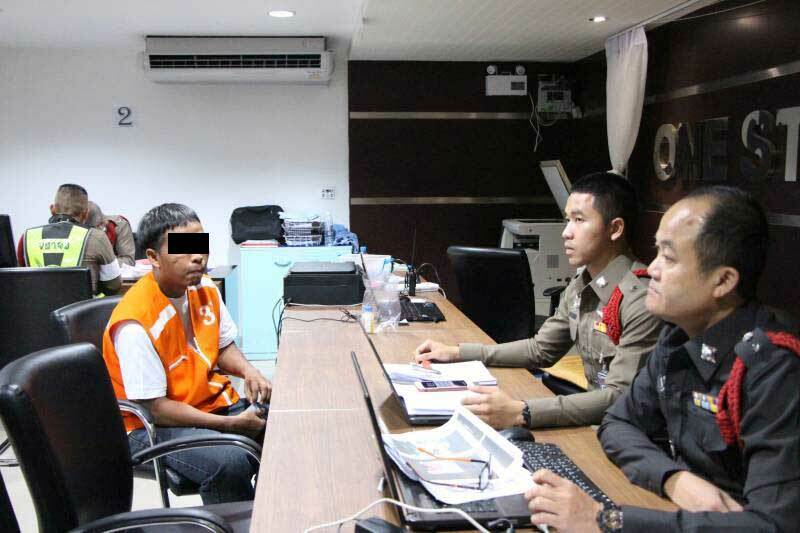 According to Daily News Pattaya police fined Sunthorn Saengkham 500 baht for assault and fined the German 400 baht after they locked up his rented bike. But today (Friday) the department of Land Transport are set to get involved in the drama - they may decide to take the licence of the motorcycle taxi driver away if they feel he has been dealt with leniently. Daily News quoted policewoman Pol Lt Chanikan Pheuanphinit as saying that the German tourist, Andreas Bauer, 40, was stopped at a checkpoint and found to have only a German licence. So the bike was locked. She said he then hauled it away with Daily News claiming that he took it 100 meters up Beach Road. "The tourist would not listen to the officers and was not happy. He tried to break the lock and flee. He looked like he was going to fight with the police. "So I decided to help them. When he swore at me and gave me the finger I snapped. "I couldn't tolerate that kind of bad behavior so I kicked and punched him. I regret it now"
Daily News said he was fined 500 baht for assault. The cops said they fined the tourist 400 baht because they had to lock up his bike. They said that the motorcycle taxi driver was fined 1000 baht. They said that the bike was confiscated and would be handed back to the rental company when they came to collect it. They quoted a police spokesman as saying that the national police chief had told the public and his men to be nice to tourists and keep their temper at all times. Especially in tourist areas like Pattaya. This kind of behavior was just not acceptable and the police should be left to do their job. Expect further developments today when the DLT get involved in the drama. Thaivisa notes that the confiscation of bikes ridden by tourists without the correct paperwork was announced by police last week. 500, 1000, doesn't really matter as it's hardly a deterrent..
Take his taxi licence for 3 months, see if that has an effect !! Another pathetic comment from the "Thai book of excuses". If a foreign tourist rode a bike without a valid licence in Australia and raised a fist at the cops he would be in more trouble than this German. If it happened in USA no doubt he'd be lying on a slab in the morgue riddled with bullet holes. That Thai motor cycle punk is nothing. IQ of 60 at best. The motorcycle/samlor,jet ski guys and cops are buddies. What was Herman the German doing with that scooter anyway? Why did he have to drag it while it was locked? The old saying " no brain all brawn "
I am sure that the cops are very pleased to hear that they have such an expert helping out in different cases. Soon we will see advertising: "Good Headkicker needed for police assistance in Nothaburi"
typical little pos kick the guy in the face when he wasnt looking.and it was none of his fkin business anyway. yes take his licence away, (i bet he will still be riding as a moto taxi anyway), where is this place in Pattaya. i see the cops had a big set up yesterday by Big C, stopping many bikes. I couldn't tolerate that kind of bad behavior so I kicked and punched him. One more disgusting Thug Pig, Motor Cycle Taxi boy of Pattaya. Theres going to be so much more of this type of thing. Not saying I agree with it but thats what needs to be done. He thought he was in the right to do so, i think, but the moto-taxi guy was thinking different. Honestly, given the choice of paying the fine, or get a kick in the face and pay the fine, the former is quite convenient.